Famous duos of the past include: Fred and Ginger, Burns and Allen and Orphan Annie and Sandy. 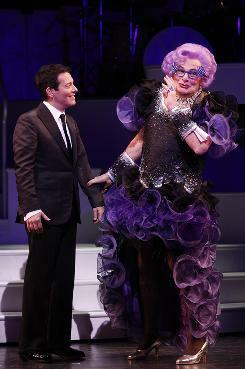 Now for the very first time, appearing separately and together in “All About Me” – we are privileged to be entertained on the stage of the Henry Miller’s Theatre by what is to become that infamous duo: Michael Feinstein, crooner and Barry Humphries better known as Dame Edna, comedienne extraordinaire (outrageously gowned by Stephen Adnitt). It’s an odd combination to say the least. And the production has been concocted by committee: Christopher Durang, Barry Humphries, Lizzie Spender (his wife) Terrence Flannery and Michael Feinstein. Individual egos run rampant and in fact there are two programs – featuring different cover photographs of the two stars – each claiming that the show is about them – only. It’s a very slight, almost invisible plot line that carries these two very strong albeit different personalities soaring across the footlights. It’s damned funny. From the guess that Broadway tune overture through the final throwing of the gladiolas you will have a wonderful time if you suspend any sort of disbelief that you are seeing anything but pure entertainment and enjoy some good singing by Mr. Feinstein of classic songs from The American Songbook which include “Strike Up the Band”, “My Romance” and “The Lady is a Tramp” which sounds like the perfect cue for Dame Edna’s entrance. Which it is. And then we’re off. They banter and play one-upmanship – he dispensing with her vase of gladiolas from his piano and she using her two back up body guys Bruno (Gregory Butler) and Benito (Jon-Paul Mateo) to dispose of the “warm up” singer. Dame Edna has a wicked sense of humor, throwing political correctness where it belongs – right out with the dirty dish water and uses her wiles and her immense charms to insult the “paupers” in the balcony and some chosen audience members. She has a quick and razor sharp wit to boot and you will be amazed – truly amazed at her incredible rendition of Sondheim’s “The Ladies Who Lunch”. We are used to seeing Michael Feinstein sitting at the piano crooning soft and tender ballads but here he is in full throttle – with a powerful voice that fills the theatre with his distinctive Mr. Show Biz style. After a stint where the stage manager (Jodi Capeless) acts as referee between the two, surprising the audience with a show stopping “And The World Goes ‘Round” the Dame and the Crooner settle down to do what can be best described as their version of Carol Burnett and Julie Andrews at Carnegie Hall. They do have great rapport and sing a great medley but not before we hear from Dame Edna an original ditty “the Dingo Ate My Baby” backed up by a great on stage band led by Rob Bowman on an all white period big band box set by Anna Louizos. Director, Casey Nicholaw has his hands full with these two but keeps his Yin and Yang stars shifting gears, gowns, tuxedoes and attitudes that will keep you laughing all through the night and well after. What a wonderful thing it is to laugh. Through July 18th.